I was never a great fan of history. Stuff done in the past. Dust and cobwebs. Rote learning names, dates, events and details. It all seemed so boring and irrelevant. I had to study some history at school, but from the moment I could choose my subjects I left it behind. History was history as far as I was concerned! Of course, this attitude is pretty naive. History helps explain who we are, where we’ve come from, what’s influenced us, what things matter and what don’t. Every time we watch the news or read the paper we’re studying history. When we flick through our family albums or read over our diaries we’re reflecting on our own history. What I didn’t appreciate for sometime was that whenever I opened my Bible I was engaging with history. I was reading of people and events in the past that were shaping my life in the present. How reliable was that history? Could it be trusted? Was it something I could stake my life on? These are important questions for those of us who want to consider, or reconsider, the basis of our beliefs. I’ve just finished reading Investigating Jesus – An Historian’s Quest by John Dickson. Firstly, let me say it’s a beautiful book! Hardback, stitch bound, colour photos of archeological sites and ancient papyri, laced with wonderful paintings and works of art, helpful diagrams, pithy quotes … and it’s well written! More significantly, this book is entirely about history. It’s about how historians do their job. It’s not a theological book. It’s not religious propaganda aiming to persuade people to become Christians. Investigating Jesus offers a good introduction to anyone wanting to learn the tools and strategies available to historians, and it demonstrates how they’ve been applied in examining the evidence regarding Jesus. These criterion are explained and illustrated in this book to show how they can be applied to the various accounts of Jesus in the New Testament. We are continually reminded that these are common tools of the trade for historians. These are the normal processes that historians, be they atheist, Christian, Jewish, or otherwise, apply to weighing the evidence before them. Archeology is also considered alongside these criterion. In recent years there have been some very important archeological discoveries that have given insight into the world of the New Testament. Some incidental details in the Gospels have been confirmed and some previously held theories about Jesus have been overturned. The concluding chapter of this book considers the difference between probability and proof. The discipline of history deals in degrees of probability rather than repeatable scientific proofs. This doesn’t mean that history only offers second class knowledge. In fact, there are strong similarities with our legal system that gains knowledge by weighing up the evidence. Historical (and legal) proof is really probability beyond reasonable doubt. If, like me, you’ve never been much into history, then Investigating Jesus is a great introduction. If you’ve never considered the reliability of the evidence for Jesus, then here’s a place to start. If you’re after an easy to read, well illustrated, clearly argued book on the historical bedrock of Christianity, then I recommend this one. In writing this, John Dickson set out to bridge the gap between popular perception and scholarly judgment about the figure of Jesus and in my humble opinion he does this well. At the end of the day, this is a ‘second order’ book. It’s like an instruction manual that shows how something works and helps you to use it. 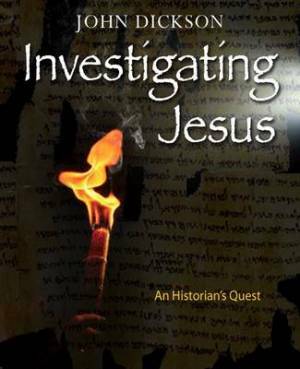 Investigating Jesus is aimed at helping the reader to investigate Jesus. It’s not an alternative to investigating Jesus for yourself. Having read this book you’ll be better equipped to go back to the primary sources, read them over and over, and weigh up their implications. If you’ve never done this before, let me encourage you to get hold of a New Testament (and any of the other primary documents mentioned in this book) and discover all you can about Jesus. 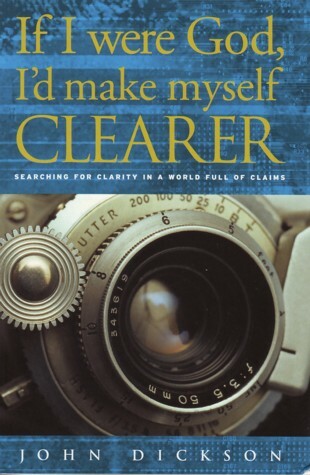 If I were God I’d make myself clearer. That’s a big call! Way too big for me. But I can understand the sentiment. Why doesn’t God simply prove beyond all reasonable doubt that he exists? Once and for all. No questions. No ambiguities. No contradictory evidence. Just clear, obvious, proof. I guess the obvious question is, what would such clarity look like? What would I consider persuasive? What would it take for you to be convinced of the existence of God? And then, which God are we talking about? There are so many religions, so many claims about God, how can we possibly know which is the right one, if any of them are? In this little book, John Dickson takes us on a pathway through the maze of ideas about God. It’s been popular for years to argue that all beliefs are really different paths to the same end. This could be for a couple of reasons. Firstly, so much blood has been spilled through religious conflict, that there seems nothing to be gained by highlighting differences that could cause more conflict. Secondly, sorting out the differences takes research, time and effort, and not many people are prepared to do this. It’s easier to stay preoccupied with trivia. John demonstrates that religious pluralism has obvious and fatal flaws. How can Hinduism and Buddhism possibly both be true expressions of reality. Hinduism has many gods, while classical Buddhism rejects the notion of any god. Christianity believes that people are saved by the mercy and grace of God, whereas Islam argues that people are saved through ethical and ritual obedience. Christianity claims that Jesus is the Messiah who fulfils the promises made to Israel, and yet Israel still awaits a Messiah. The Koran claims that Jesus was neither crucified or resurrected, while Christianity hangs everything on these events. A quick assessment of these claims highlights the bankruptcy of pluralism. It could be that none of these religions are true, but there is no way they can each be true. This is a scary prospect in a world committed to tolerance. However, John offers us a better understanding of tolerance. Such an understanding of tolerance opens the way through the maze of ideas. We can be intellectually rigorous and culturally sensitive in a way that overcomes bigotry and discrimination. We don’t have to paint over differences but can be freed to respectfully discuss, and argue, and explore and persuade one another. This book argues that Christianity is to a large extent a ‘verifiable’ religion. This is not to say that it’s true, but that it’s founded upon public, historical, evidence. It makes claims that can be tested through historical, archeological, literary, and critical scrutiny. The implications of this are important. If none of the places, dates, names or events pertinent to Christianity could be attested anywhere else, there would be good grounds for being suspicious as to it’s truth claims. If it could be demonstrated that Jesus never lived, was not crucified, or did not rise from the dead, then Christianity could hardly be trusted as the way to God. As it is, Christianity makes some dangerously verifiable claims and invites people to check them out. No tricks or mirrors – just open investigation. 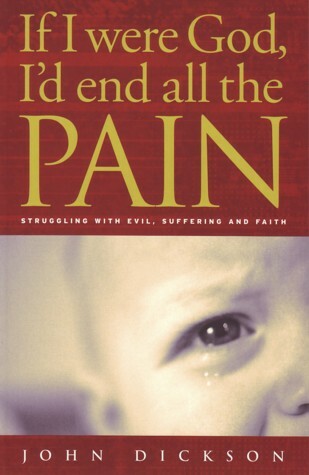 This is a book that invites such scrutiny. Some sneered, some followed, and others were keen to find out more. If you’d like to find out more, this little book by John Dickson will help point you in the right direction. It’s hard to know how to review John Dickson’s book, Humilitas. With humility I suppose, or at least without humiliating myself! It’s hard because I’m not much of an expert on the topic, and it’s doubly hard because the author is a good mate whom I greatly admire. I’ve always been stimulated through reading John’s books. I confess to having envied John’s capacity as a preacher, didgeridoo player, author, and general all round talent. But mostly I just like having the occasional catch up, coffee together, and being encouraged by an old friend. Well, Humilitas is not what I expected! I’ve grown accustomed to John writing books on the life and teaching of Jesus, books that answer difficult questions, and books seeking to persuade others to follow Jesus. I quickly discovered that this is a different type of book, pitched at a different audience. This is not so much for the enquirer into Christianity, as the one who is seeking to grow as a leader and build stronger relationships with others. (Not to suggest these are mutually exclusive, by the way.) I’d expect to find this book sitting comfortably alongside books by Ken Blanchard or Max de Pree in the leadership section of your local bookshop… if there are any local bookshops still in existence! 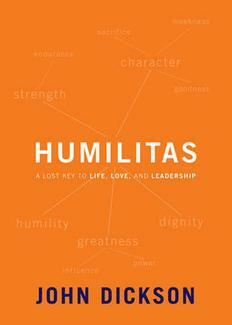 I found Humilitas a good read and completed it in a couple of sittings. John is self-effacing as he writes, only too aware of the sitting duck he has become in presuming to teach on humility! He writes with grace and style, colouring his work with historical and contemporary examples of humble men and women. Indeed, I loved reading some of my favourite anecdotes from A Sneaking Suspicion now providing powerful illustrations of humility in action! But this is not a repackaged, ‘slap together’ paperback by a prolific author. It shows evidence of serious research over many years, much of it historical, laying a foundation for an academic and yet highly practical work. As I was reading this book, I also listened to James O’Loghlin interviewing John about the topic on ABC radio. It helped bring the book to life even more. You can listen to the interview online. Three thoughts are inherent in this definition of humility. Firstly, it presupposes your dignity. The humble person begins by being aware of their worth and abilities. Secondly, it is a choice. Otherwise it would simply be humiliation. And thirdly, it is social, as it’s shown in putting others before yourself. John argues persuasively that humility is a necessary ingredient to truly successful leadership. He demonstrates that it’s common sense to cultivate humility in our personal and professional dealings with others. He highlights the aesthetics of humility, not as an ornament to be worn, but as an inner virtue that is attractive to others. The historian in John comes to the fore as he reveals how humility wasn’t always a prized virtue in the ancient world. In fact, self-congratulation and boasting (that would often be despised today) was much more common and accepted in the ancient world. However, something happened to change this perspective, such that humility is widely recognised as a beautiful and desirable virtue today. My point is not that Christians alone can be humble; rather, as a plain historical statement, humility came to be valued in Western culture as result of Christianity’s dismantling of the all-pervasive honour-shame paradigm of the ancient world. Chapter 7 – Growth: Why humility generates abilities. Chapter 8 – Persuasion: How character determines influence. Chapter 9 – Inspiration: How humility lifts those around us. Chapter 10 – Harmony: Why humility is better than “tolerance”. Chapter 11 – Steps: How it’s possible to become (more) humble. I found myself wanting to add another thought to this list. Pray. God wants to transform us into the likeness of his son, Jesus. The Bible teaches that to become more and more like Jesus involves becoming increasingly humble. So I recommend we ask God to grow an attitude of humility within us. In fact, I must confess to often praying something like: Dear God, please make me more humble, but without humiliating me. A dangerous prayer, perhaps! This is a helpful book. It’s not a religious book, and it should appeal to people of many walks of life, cultural contexts, and different philosophical and religious persuasions. It’s a book I would recommend or offer to others, especially those in positions of leadership. As a Christian it whet my appetite to learn more of what God says about humility. To look more closely at the life and teaching of Jesus Christ, and what others have said about him, inside and outside the Bible (especially in the Apostle Paul’s letter to the Philippians). In fact, I would like to see a follow up or addendum to Humilitas. Perhaps John could produce a study guide, or discussion questions, or a specifically Christian booklet, that would take us deeper into the the Bible’s teaching on this important topic.